Gujia is a sweet of North India. It has been part of celebrations since a few hundred years. 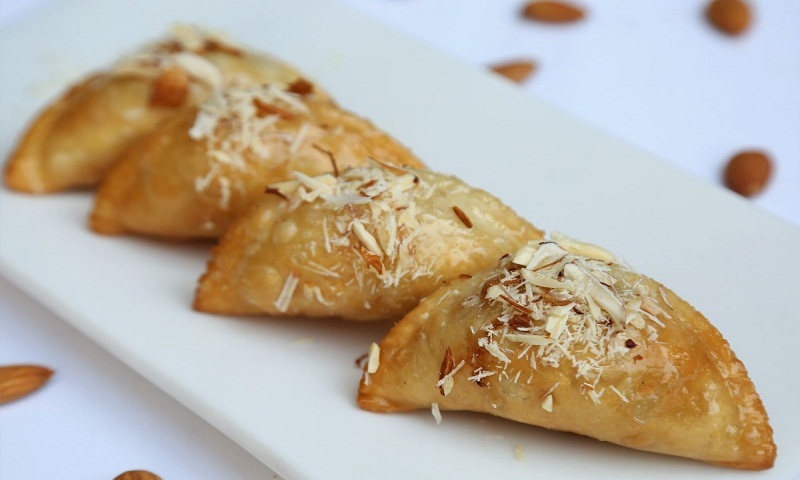 Though it is traditionally offered to loved ones on festivals like Holi but it can be enjoyed during this time of the year when the Holi festivities are over. During this season, gujias can be made and kept in airtight jars for a few days. Gujias are easy to make. In this recipe, they are deep fried but not soaked in sugar syrup. So they are not too high on sugar. Sweet shops around the country might be selling them these days but the mawa (khoya) used in making this delicacy can be adulterated. So it is advisable to make them at home and enjoy them with purity. Mix maida and sooji together. Add one-third cup of melted pure ghee. Mix well. Add enough lukewarm water to make a soft and stiff dough. Knead properly to make it smooth. Keep it covered for an hour.Make mawa filling mixture. Mix well mawa, dry coconut, chirongi, cashew nuts, almonds, raisins, cardamom powder and boora altogether.Make small 30 to 35 balls out of this maida dough.Roll them round like poori having a diameter of four inches.Now place this rolled maida on gujia mould. Place two teaspoons of mawa filling in the centre. On the edges put a thick paste of maida and water to seal the gujias. To make this thick paste, mix two tablespoons of maida in one tablespoon of water. Close the gujia mould and press tightly from the edges to seal gujias. Now heat pure ghee in a deep frying pan to fry gujias. When the ghee is appropriately hot for frying, put gujias and deep fry them crispy golden flipping on both sides. Take them out on a kitchen towel. Let them cool. Store them in an airtight jar. You can make mawa at home. Take two litres of full cream milk. Pour it in a thick bottomed pan. Give a boil on high flame. Simmer it on low flame stirring occasionally till milk turns in to khoya or mawa form. It will take around an hour to thicken the milk in to mawa form. You will get around 400 grams of khoya by thickening two litres of full cream milk.